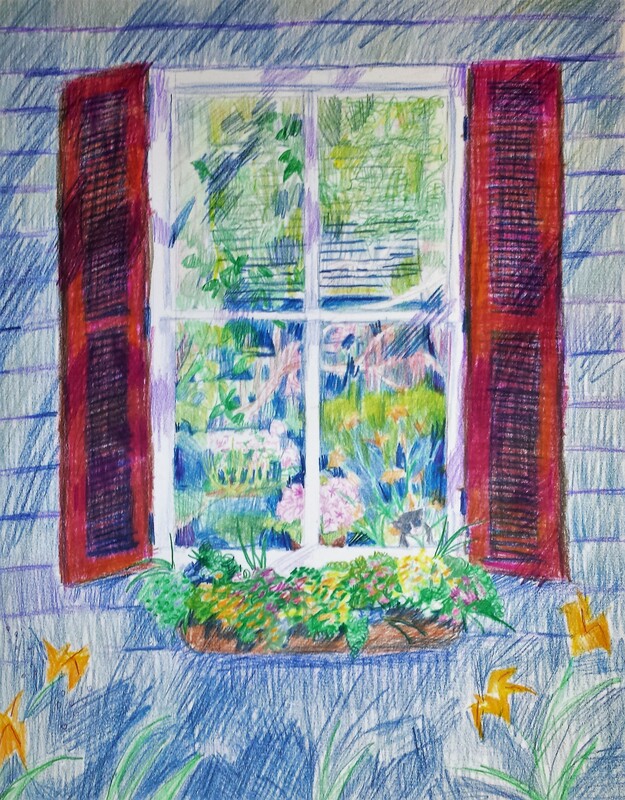 The drawing I started one sunny, balmy day in spring, is now finished on a crisp autumn day. Where has the time gone? Guess between job changes and personal life changes, I’ve been busy. Hard to believe that I only have been able to complete one drawing in all that time! Have you found the kitten yet? I wanted to explore the many layers of distance and surface area in this drawing. I have the reflection in the window, you can see through the window to the flower pot, the kitten and beyond. And the side of the house, and the flowers in front of the house…etc, etc. Started out as a puzzle to see how many layers I could get in. But as I worked on it, I realized it could be seen as a metaphor for consciousness…dream state, objective state, subjective observations, and so on. Or maybe it’s just a pretty picture and I’m pushing too much. It was fun to do, even if it took, well not forever, but a good part of eternity.